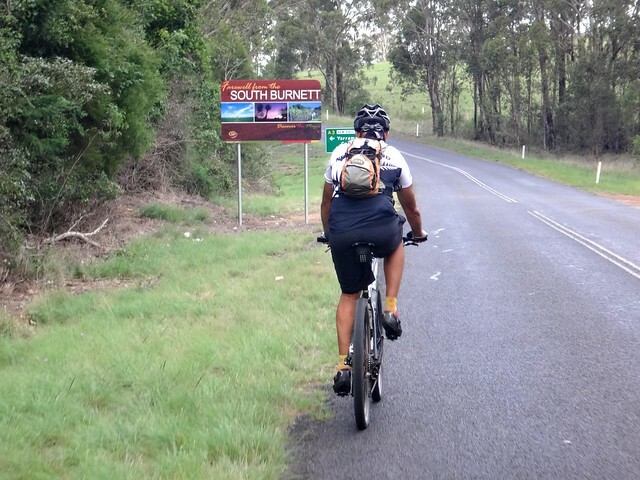 A couple of weeks ago, Eric and a few other friends rode 350km over four days from the Bunya Mountains in Queensland’s South Burnett region to Brisbane. After looking at the route that he took, I mentioned that I thought he could shorten it and complete the journey in two days. 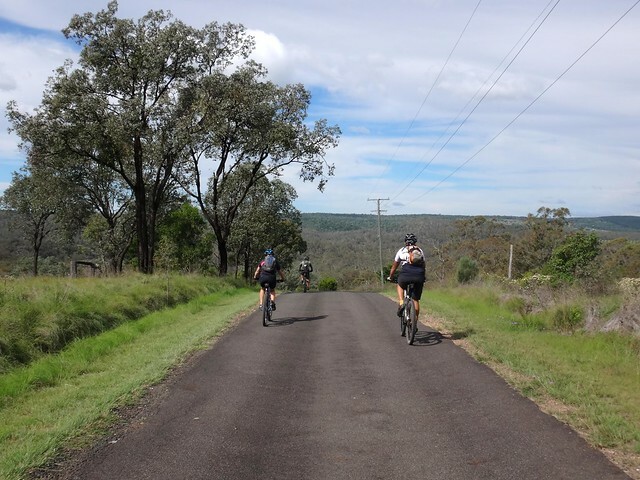 Part of the purpose of today’s ride was to look at possible ways to shorten that journey, and also to explore the old stock routes of the nineteenth and early twentieth centures. 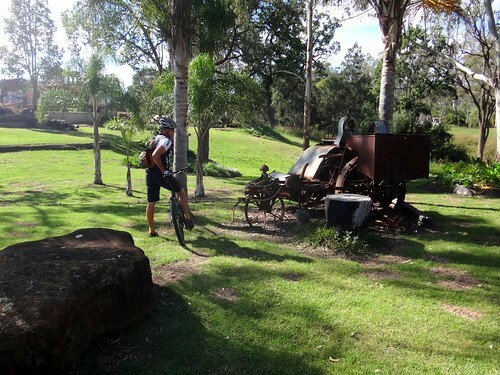 The small town of Cooyar, halfway between Kingaroy and Crows Nest, has a fascinating history. It’s the traditional country of the Wakka Wakka and Jarowair Aboriginal people. 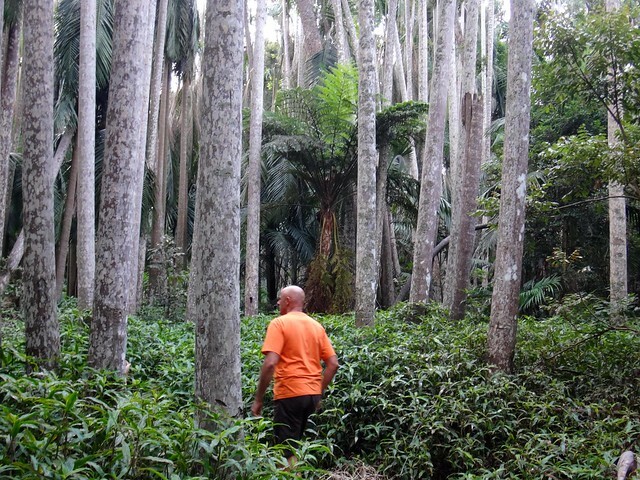 For thousands of years, indigenous people from many different groups passed through here on journies which started hundreds of kilometres away, as they travelled to the nearby Bunya Mountains for important gatgherings. 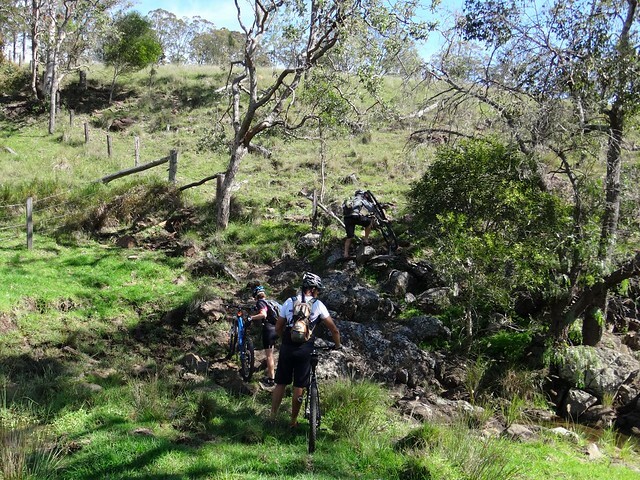 In 1845, the Archer Brothers established huge sheep stations on Cooyar Creek and Emu Creek, further south. 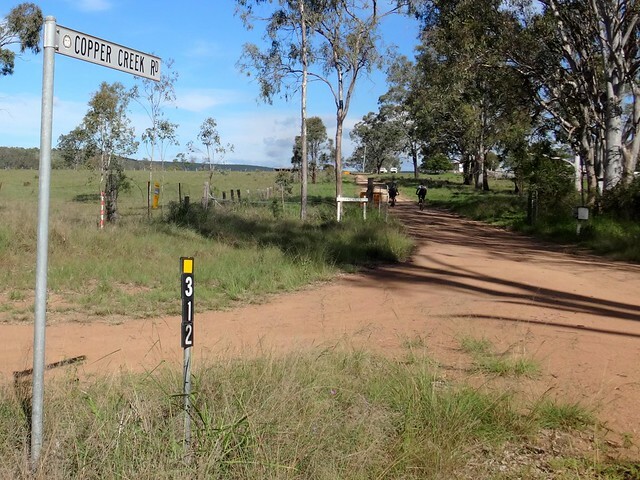 Several decades later, cattle drovers regularly travelled along stock routes through Cooyar, bringing cattle from Nanango to sale yards in Toowoomba and Brisbane. 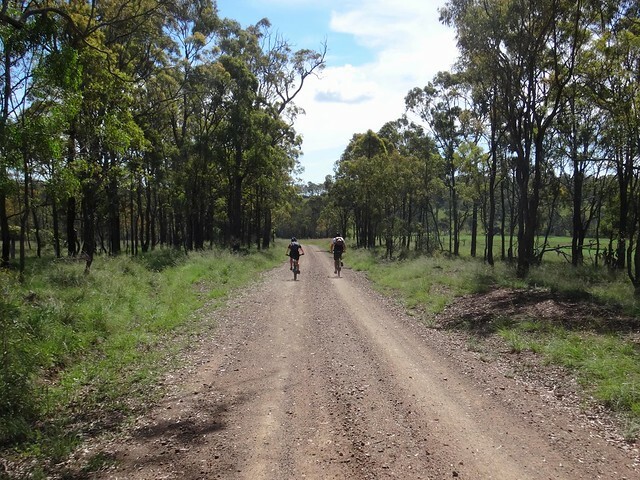 We started our adventure by following one of these old stock routes along “Old Cooyar Yarraman Road”. It’s a rough track barely visible through the long grass. But it is used for moving stock, even today. Hoof marks made deep indentations in mud, which had since hardened making the surface rough to ride on. 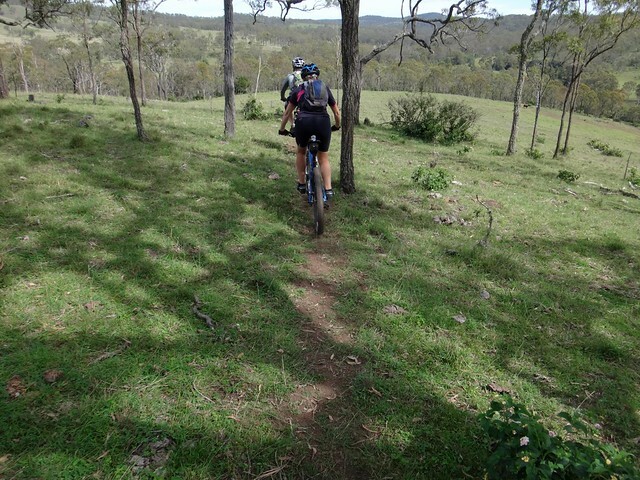 The track continually climbed as we headed west towards the Bunya Mountains. We were definitely walking in the footsteps of the old drovers. With emphasis on the word “walking”. 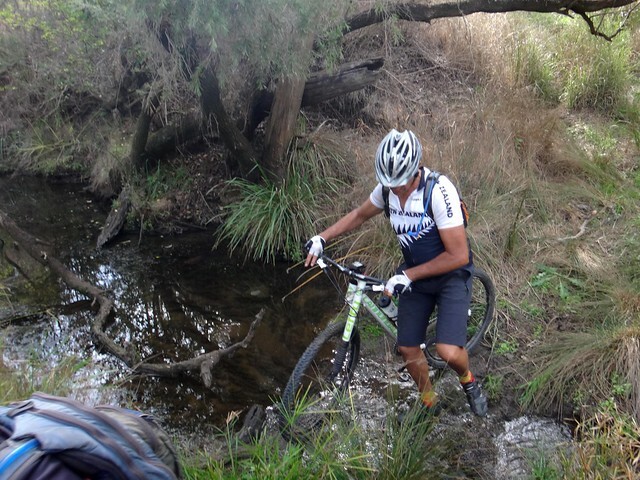 Our route was unrideable in many places, espcecially across the beautiful, but rugged creek crossings. How did they get cattle through here? Avoiding electric fences where possible. 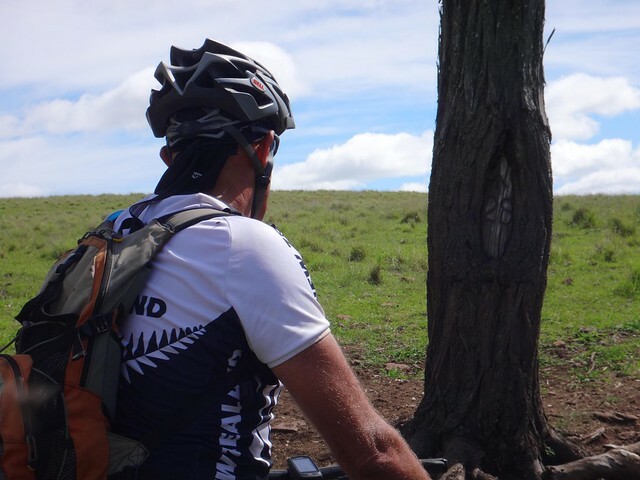 Although it was difficult to see we were on a stock route, we were re-assured when we found this survey marker blazed into the trunk of a wizened old Iron Bark. The rock causeway had been built a long time ago to make it easier for travellers to pass over the boggy ground. 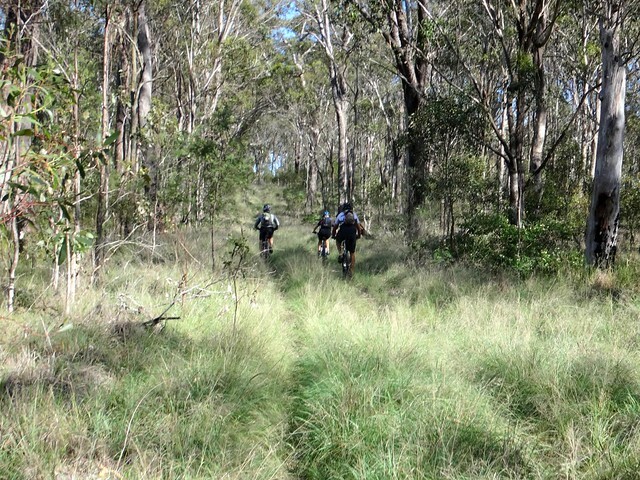 Eventually we encountered cattle tracks. Eric often praises the clever instincts of cattle. 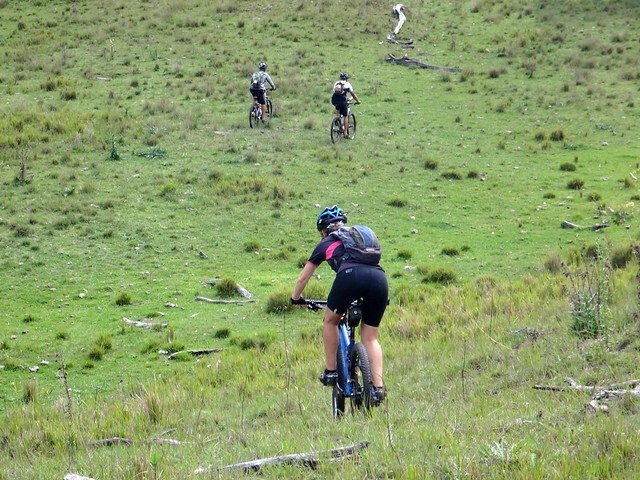 As they continually walk the easiest route through rough terrain they wear out a smooth twisting track which is perfect for riding a mountain bike along. 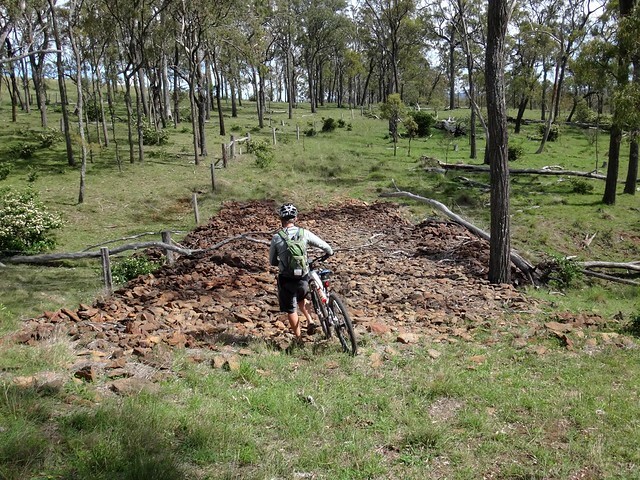 I had built in a “bail-out” option into our route in case it took longer than we anticipated. 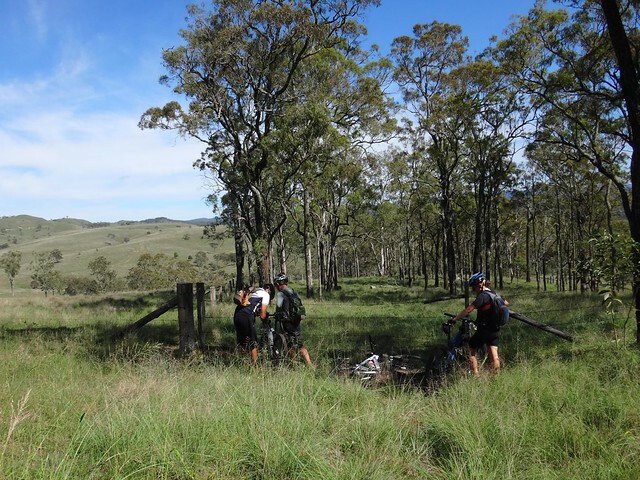 After walking through numerous rough paddocks, we were behind schedule, and decided to take the bail-out route to shorten our ride to Maidenwell. Unfortunately, although we didn’t realize it at the time, we actually missed the “bail-out” route. 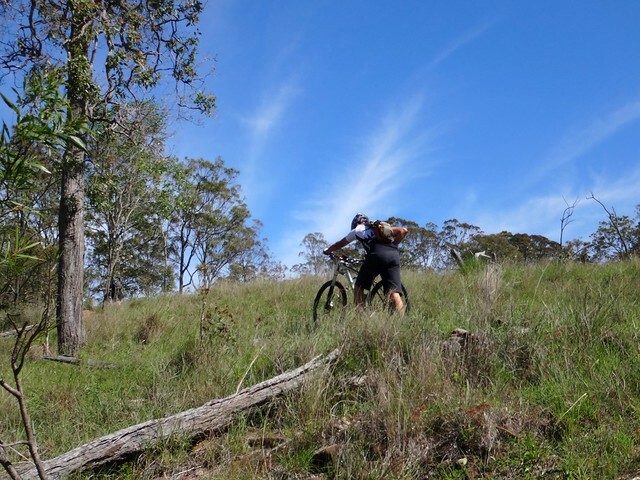 This meant another hour of “paddock bashing” as we hiked our bikes up steep hills several hundred metres east of where we were supposed to be. 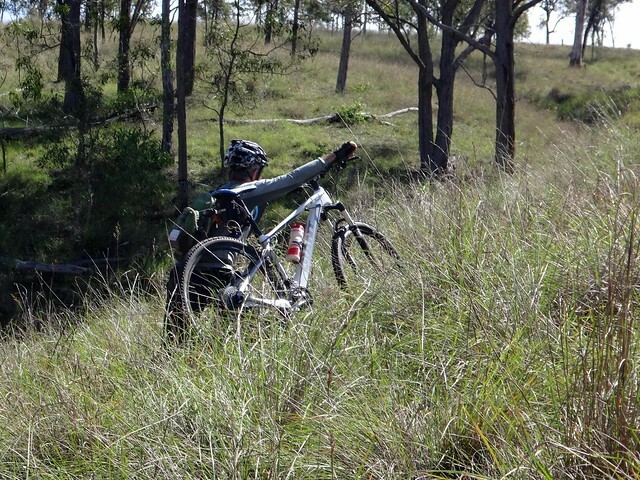 Note to self: If you’re going to build a “bail-out” option into a route, make sure you clearly mark it. We eventually emerged, begraggled and relieved onto Cause Road – west of Maidenwell, and made our way into town for lunch. The Maidenwell Pub is delightful. 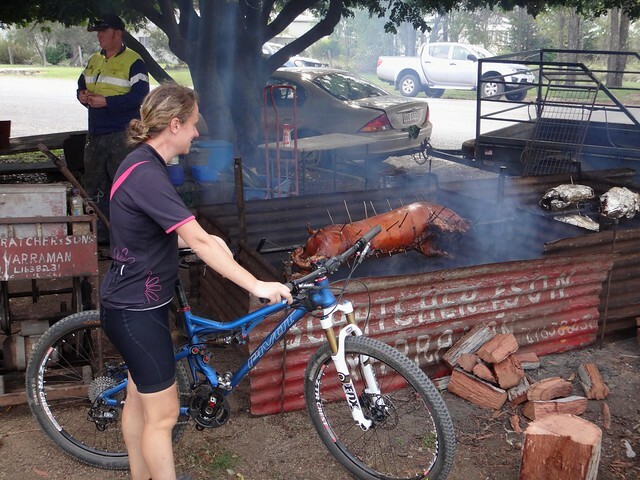 A whole pig was roasting over a spit outside as Country and Western music blared from a portable CD player. 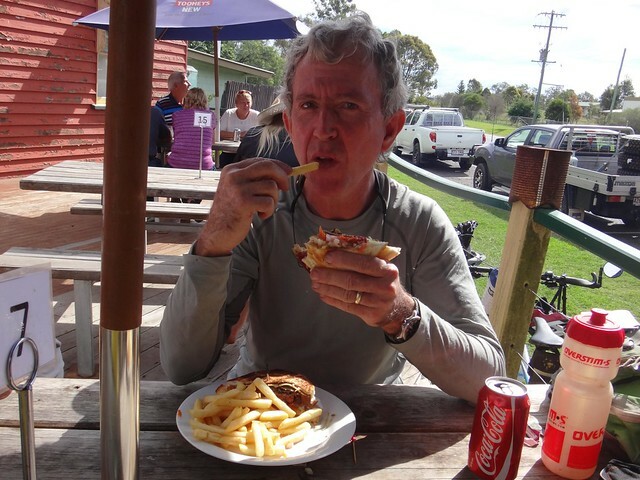 We enjoyed the sounds, sights, smells and taste of rural Queensland while devouring our lunch. The locals were friendly and curious about what we were up to. It’s a bit difficult to explain it all in sixty seconds, but I think we conveyed the main point which was that we were exploring this amazing place on our bikes, and we were loving it. Things might not have gone exactly as we had planned, but we were delighted to be here. 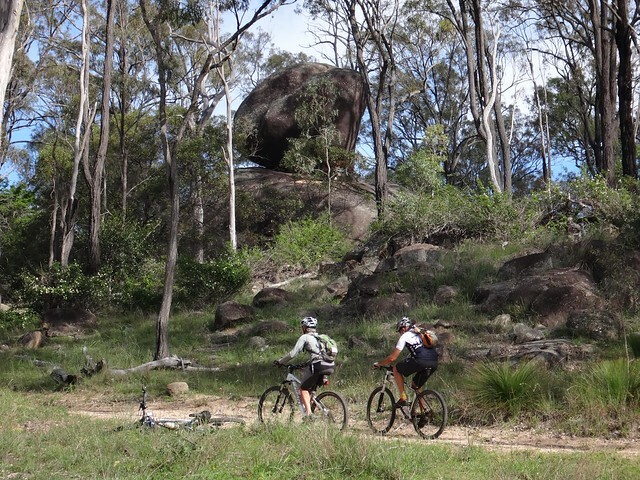 With full bellies, and feeling slightly sleepy, we set off for the second stock-route of the day along Tanduringie Creek near Coomba Waterhole. The land around Maidenwell is strewn with huge boulders. We passed gingerly under one that was perched precariously on a hillside. 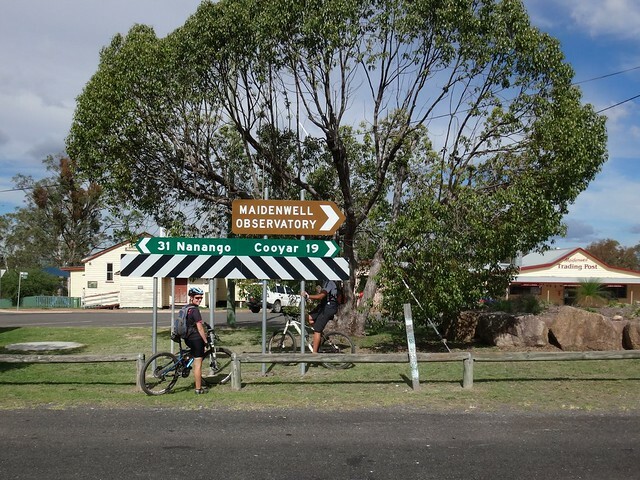 … which was undergoing a makeover by the local council. 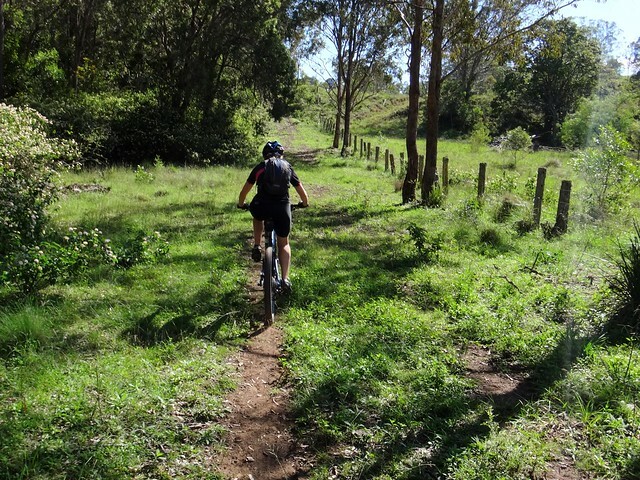 Rather than follow our planned course up into the pine plantation, we decided to take a risk and continue following the remnants of Copper Creek Road. You think we would have learned our lesson of going “off course” from our experiences earlier in the day. 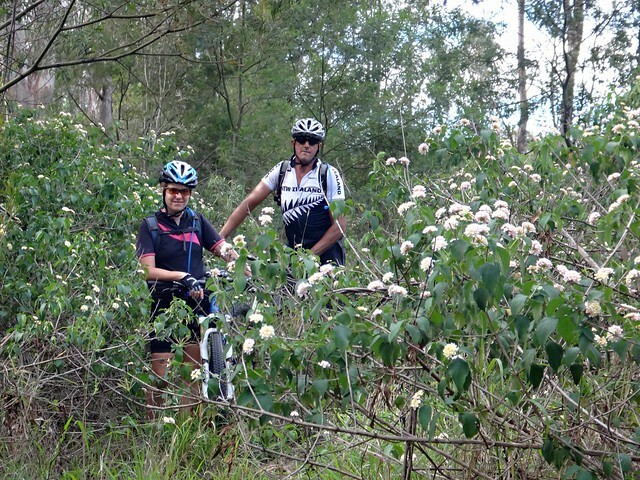 The cursed lantana grew thicker, poking and scratching us as we tried to pedal around it. 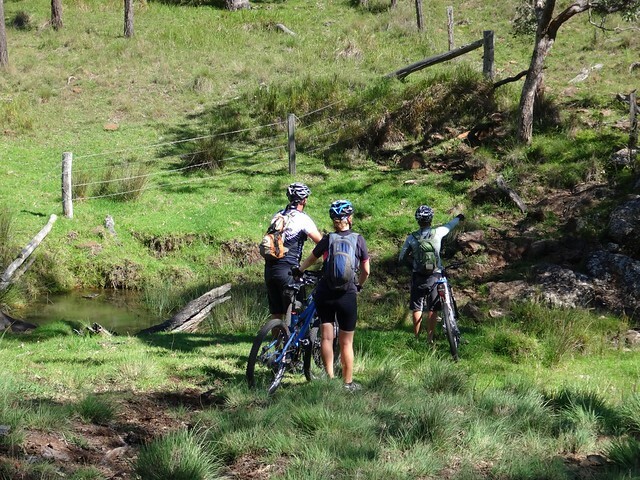 At a washed out creek crossing, we decided to bail out again. 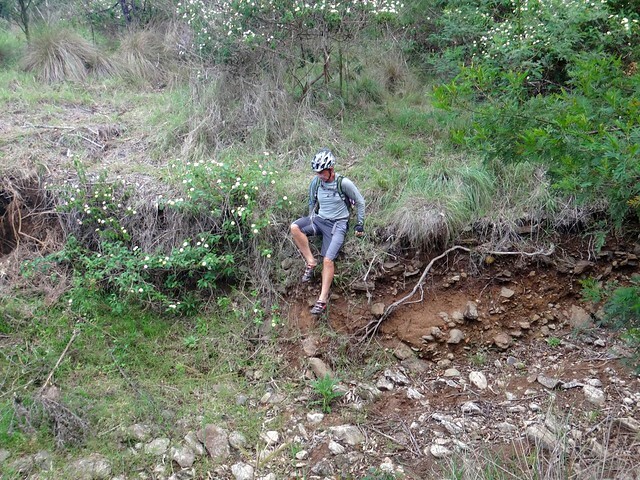 The lantana was too thick – even to hike through. The day was growing late. It was time to cut the journey short and head home. … back to the paved road. 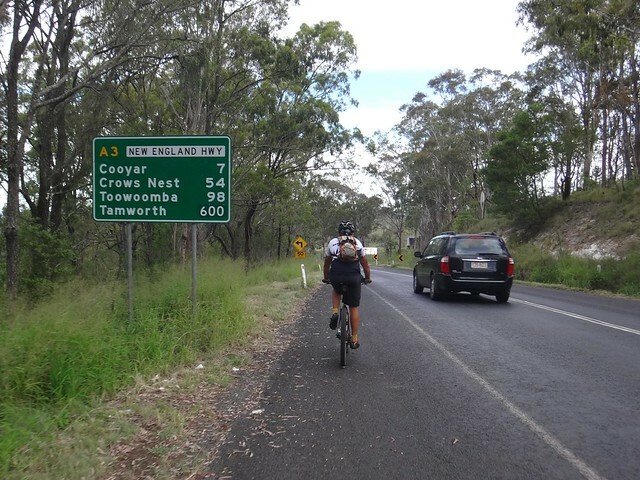 The final stretch into Cooyar was on a steep bitumen descent down the New England Highway. 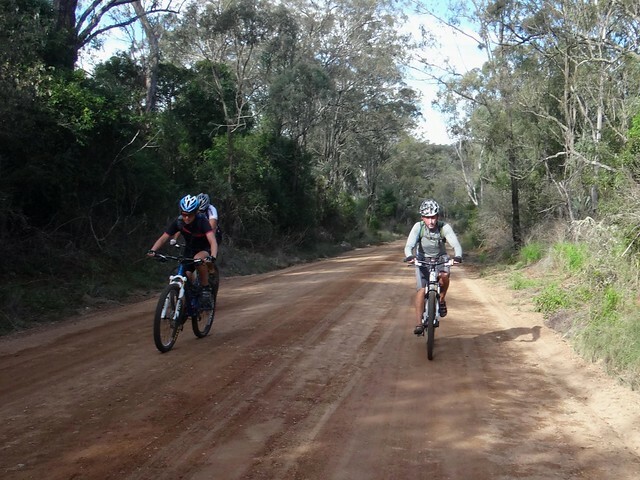 It wasn’t dirt, but it was fun to release the brakes, and listen to the howl of the tyres and the roar of the wind as we sped back into town. Although we didn’t quite make it to “The Palms” National Park on this ride, I was grateful for the chance to enjoy a quick stop there on the way home. We’ll be back again soon – I feel like we have unfinished business here. All up we rode about 53km in six and a half hours including breaks. 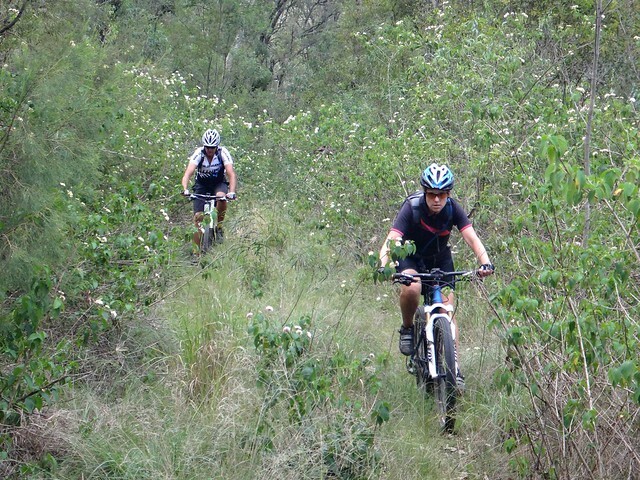 We climbed 1,100m in vertical ascent. 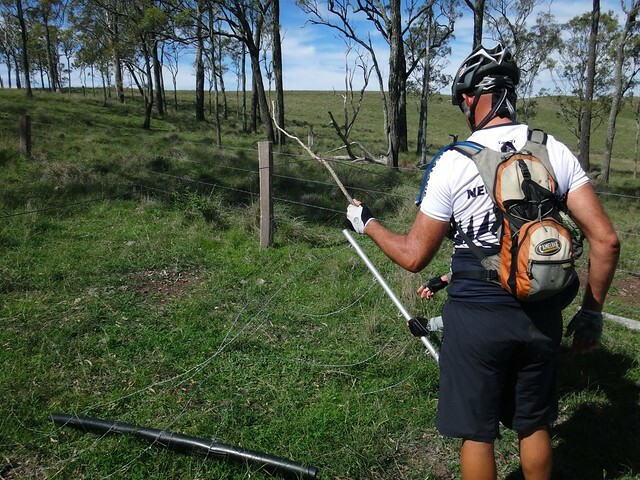 If you’re thinking of retracing our steps, please don’t follow the western part of our course – it was rough and unrideable. 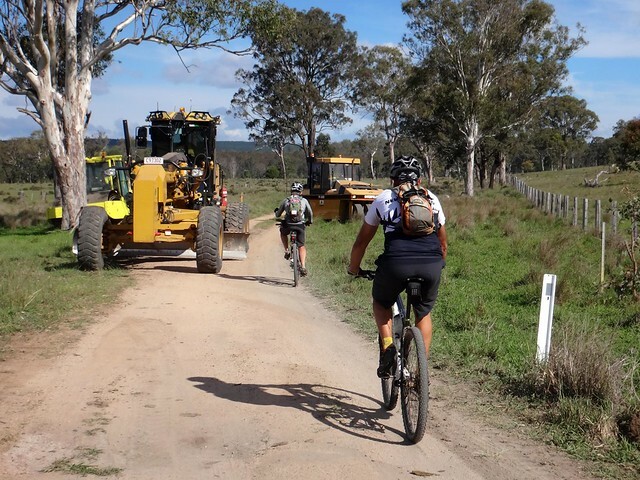 I’ll rate this ride 9 out of 10 on the tough-o-meter because of the rough paddock bashing. Let’s see if we can find a way to avoid those rough bits! Thanks Becca, Eric, and Paul for your company today. Thanks for sharing your experiences. I grew up in this area. 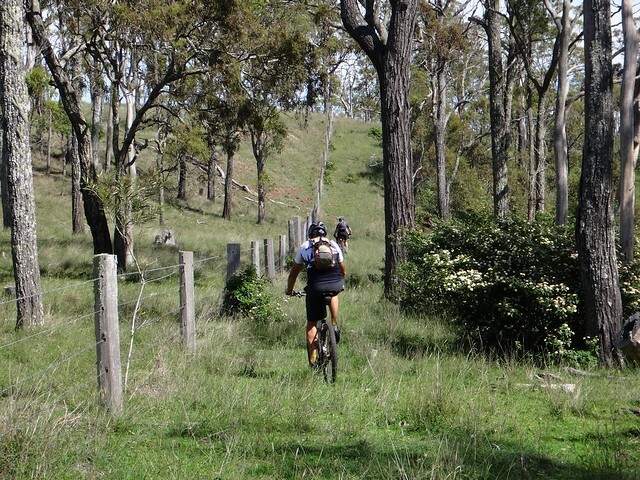 I have been wondering if there might be a way to join the rail trail terminus at yarraman with the Bunya Mountains via public land or public rights of way to eventually make a kind of cultural walk/ride. You might find my ride map useful. 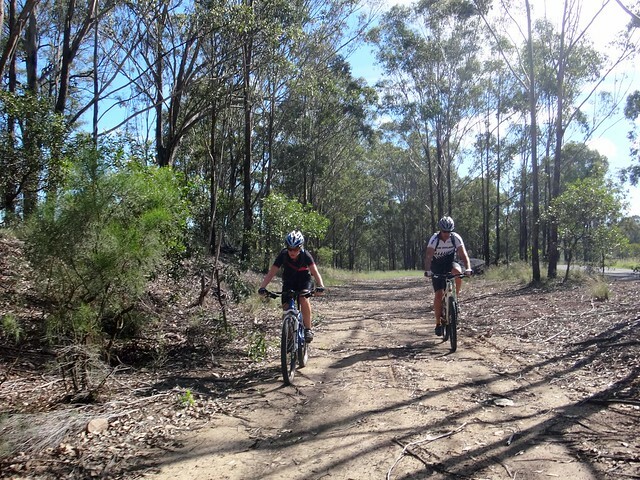 It shows most of the off-road places we’ve ridden (and tarmac where necessary).